Panzergrenadier Company HQ (GBX75) includes three plastic Sd Kfz 251 half-track sprues, three plastic Crew sprues, two plastic Panzergrenadier Command sprues, one Half-track decal sheet, two Small three-hole bases & one Medium four-hole base. A Panzer division’s Gepanzerte, or armoured, Panzergrenadier battalion has armoured half-tracks to allow it to keep pace with the tanks on attack. The armoured Sd Kfz 251/1 half-tracks also offer a level of protection from small arms fire and shrapnel while on the move. 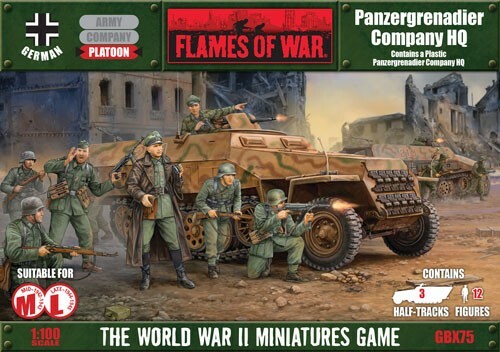 Combined with Panzergrenadier Platoon (GBX76) the Panzergrenadier Company HQ box set allows you to collect the bulk of your Gepanzerte Panzergrenadierkompanie by simply combining the Company HQ with two or three Gepanzerte Panzergrenadier Platoons.